February 9, 1971 — Freeway overpass at the 5-14 split (Newhall Pass) as it appeared on the day of the Sylmar-San Fernando Earthquake. 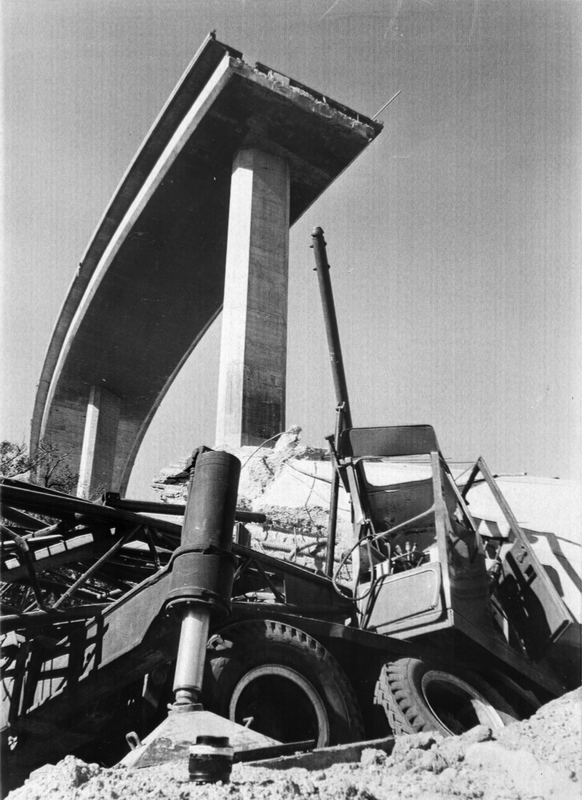 NHP020901S — 2/9/1971 — NEWHALL, CALIF: The earthquake that hit Southern California caused part of massive elevated freeway to collapse, burying the 80-ton crane (bottom) which had been used in work on the freeway interchange, which intersects US Highway Interstate 5. Miraculously, no one was killed. UPI TELE. LW2794: 9600 dpi jpeg from original photograph purchased 2015 by Leon Worden.